In just a few days western Easter will be celebrated. Here in south Florida the weather is as always…brilliant blue skies, soft, cool breezes and that blinding, white sunlight so typical of this time of the year. It’s always been that way. 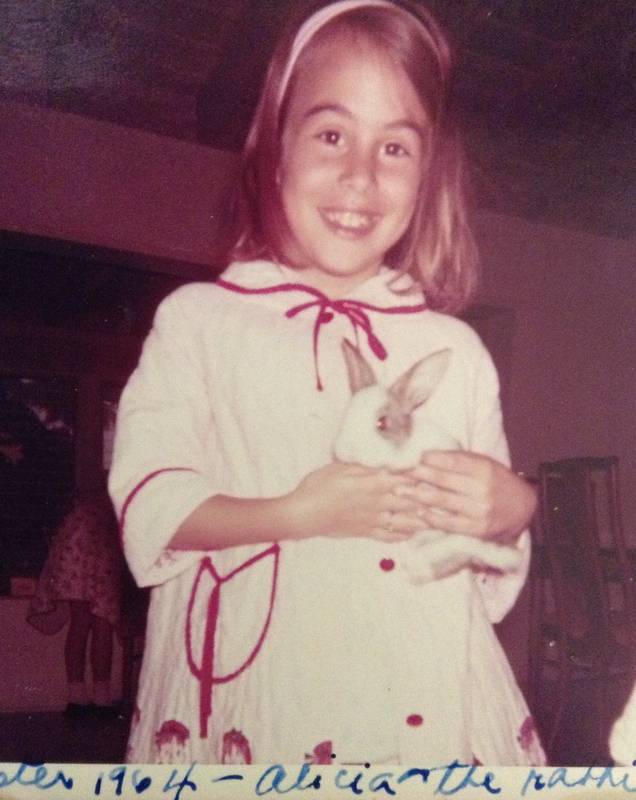 As children Easter was one of our favorite holidays. There wasn’t the pressure and stress of Christmas, we got pretty, new outfits and best of all was the CANDY!! In our house the only time candy in large quantities was allowed was Halloween and Easter. There were never cookies after school. We had apples, oranges and bananas. Mama never exclaimed “Let’s bake a cake!”. Mama’s idea of a good cake was the one she was about to pick up from Las Olas Bakery. No. There were never sweets in our house. And it wasn’t just Mama. Dad leaned towards vegetarianism and would give Mama a hard time if she brought home any kind of baked good. “Cookie”, he’d say, “don’t give them that stuff. It’s bad for them. It’s junk.” “Okay, Jackson.” And that was the end of that. Every once in a great while she’d sneak into the house those mini grocery store donuts that came in a bag. We all called them “dancing teenager donuts” because there were boys and girls in silhouette, the girls in minis and the boys in skinny pants and loafers all dancing across the bag. It looked like they were all doing the “Pony”. But on Easter there was candy all over the house!! Look at that sugar ring around Tommy’s mouth! We each had our own baskets used year after year as we did our Christmas stockings. I no longer have my basket; Dad probably threw it out. But it was magnificent. All of our Easter baskets were!! Mine was a rich, eggplant purple, large in size and deep. Perfect to hold lots of trashy Easter candy. I remember one particular Easter season when I was maybe eight or nine years old my mother and I had a heated argument. Well, MY end was probably loud and heated…Mama never raised her voice at us. I remember being white-hot angry, incensed and yelling to her, “I hate you! I’m running away and you’ll never see me again!” Can you imagine saying something so hateful to your mother? Well, I did say it. She calmly continued loading the dish washer and replied, “That’s fine, Cielo. Be careful.” Now, remember. This was almost 50 years ago. Children didn’t have or care about luggage. When you traveled your mom assembled your wardrobe and packed the bags. Fury fueling my ill temper I tore to the garage in search of a suitcase. There were only large, cumbersome, leather bags tidily stacked to the ceiling. None would do. I was desperate. And then I spied our four Easter baskets Mama had set out in preparation for the coming Sunday. I grabbed my purple beauty and ran to my room. Throwing in a top and a pair of shorts I made my way to the kitchen. If I was to be on my own I would need food. The only problem was in our house there never WAS any food. What to do? What to do? I know!!! I grabbed the only food available. And, conveniently for me, portable! Oranges, apples and bananas were stuffed into my basket and I was ready. Muttering under my breath and slamming as many doors as possible I made my grand exit. Mama paid me no attention. I hooked my basket over the handlebar of my bike, flipped my kickstand back and was off! Adrenalin racing through my body I rode my bike almost standing up. I’d show them. They would N.E.V.E.R. see me again. We lived four bridges off Las Olas, the main drag, and at eight years old I was not yet allowed to leave the islands. “Who cares?”, I thought, “I’m on my own!” Over the bridges I sped and made a right onto Las Olas. As I passed Nurmi and Isle of Venice I felt the basket getting heavier and heavier. And it kept banging up against my tennis shoe, my knee and the bike, oranges and apples bouncing precariously. As I crossed the little fixed bridge after Navarro Isle I had a scary thought. Well, scary for an eight year old. Right at Jody Cabot’s house the thought occurred to me, “IT’S GETTING DARK.” It’s getting dark. I slammed the bicycle pedals in reverse and came to an abrupt stop. I had nowhere to go. There was no consideration or hemming and hawing in THIS 3rd graders mind! I spun my bike around so fast and took off for home. I remember having the thought, “I’ll runaway tomorrow.” Ha! And every time I pass the Cabot house, which is now townhouses, the thought still crosses my mind, “Yup. It’s getting dark.” No one said anything or even noticed when I came BACK into the house, old , purple Easter basket swinging across my arm. And Easter came as usual. 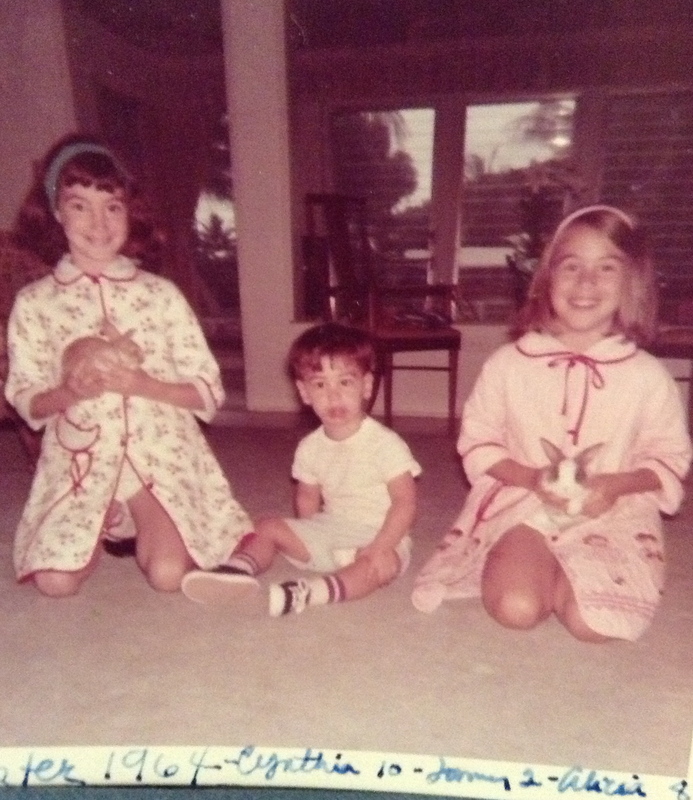 That year, in addition to masses of bad candy, our parents gave the four of us BUNNIES!! Sweet, fluffy bunnies! After the thrill wore off I was somehow responsible for them. Months later it had become too much for this 8-year-old. I wasn’t playing with them so they had become wild and their pen had that awful animal pee stench. I came home from school one day and the bunnies and their pen was gone. “DAAAAAAd!!! The bunnies are gone!” “‘I know”, Dad replied, “You didn’t take care of them so I gave them to Rodell”, (our lawn man). “I heard him say as he was leaving something about rabbit stew tonight.” Thanks, Daddy. But Happy Easter everybody! This recipe is for Puerto Rican roasted turkey. It is just sublime! 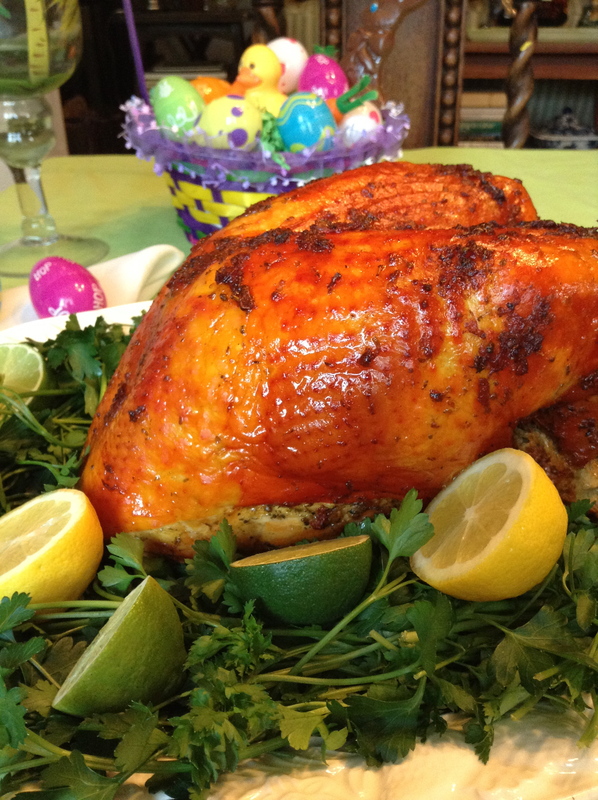 The flavors explode in your mouth and give new meaning to the same old holiday bird. 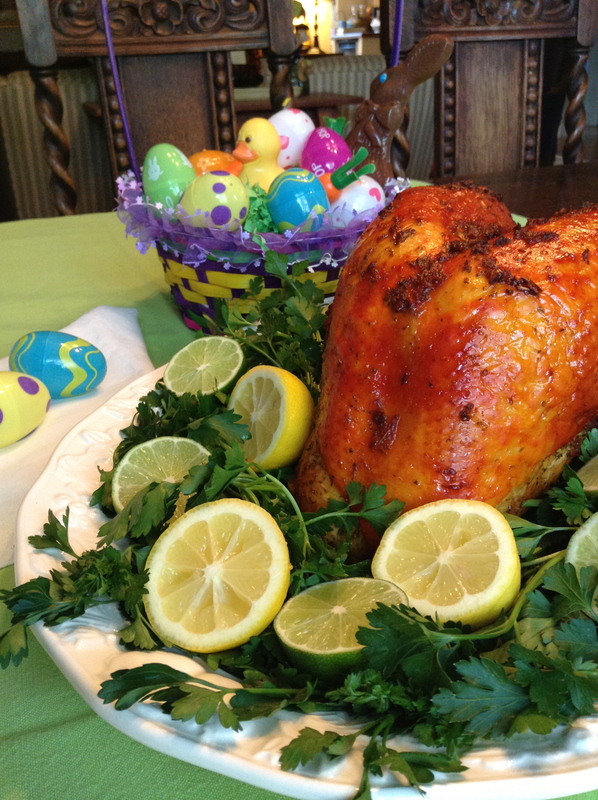 This method of serious marination works on whole and breast of turkey as well as chicken. The longer it marinates the better it is. I marinated this breast two days in the refrigerator, turning it over and massaging the spices in some more after one day. After rubbing the marinade all inside and out I placed the bird in a clean trash bag and squeezed as much air out as I could. This gave the flavors more of a chance to be absorbed and also the meat didn’t take as much room in the refrigerator as it would have had I put it in a baking dish. The turkey breast wouldn’t stand up since it was missing the rest of his body so I loosely wadded up four sheets of aluminum foil and placed them around the meat thus steadying it. It you choose to roast a whole turkey a Mofongo Stuffing takes this dish over the top! And I promise I’ll post the recipe for that soon!! 1. One or two days before roasting the turkey rub all over, inside and out with the adobo. I use roughly one teaspoon for every pound of turkey. 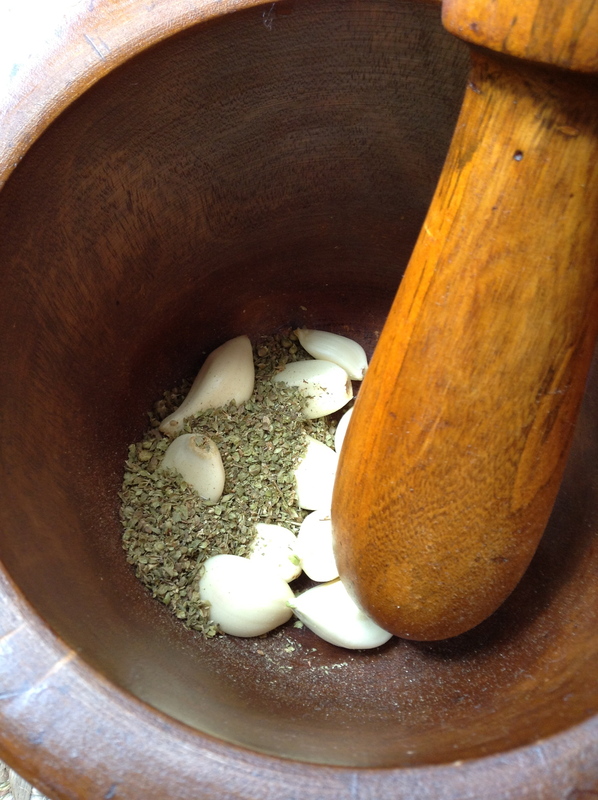 Mix together the garlic paste, oregano and pepper and cover the inside and out with it. Place in the refrigerator until your roasting day. Take the turkey our of the refrigerator and hour or two before roasting so it will come to room temperature. If you’re going to stuff your turkey now is the time. Coat the entire turkey with the vegetable oil. Cover the whole turkey with an aluminum foil “tent” and put in oven. I cook a 4-6 turkey about 3 hours. I cook a 6-8 pound turkey about 4 hours. I cook an 8-12 pound turkey about 4-5 hours. Since every oven is different check your bird as it gets closer to completion. It would be hard to beat a Las Olas Bakery cake! Trish and I still pine for those birthday cakes. Their chocolate frosting was devine! That’s all I gotta say ’bout that! Yeah, but let’s don’t forget their COCONUT CAKE!!!!! Stellar. Their coconut cake was the best in the land. Bar none!! !